2 years ago I wrote about all of the foods I ate in Singapore, and this time I’ll be doing the same with a few extras. I’ll focus more on the new places but also touch on the places I had been to before and revisited. On the first night I was in Singapore, I went to a restaurant in my hotel called Ah Hoi’s. 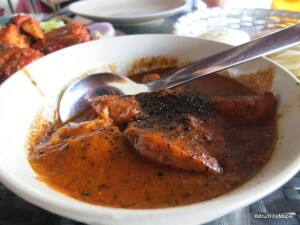 I wanted to eat chili crab and found out that Ah Hoi’s is somewhat famous for their chili crab. What I didn’t know was that the chili crab is HUGE. I made sure I could bring things back to my hotel room afterwards and ordered it along with some satay and Nasi Goreng. 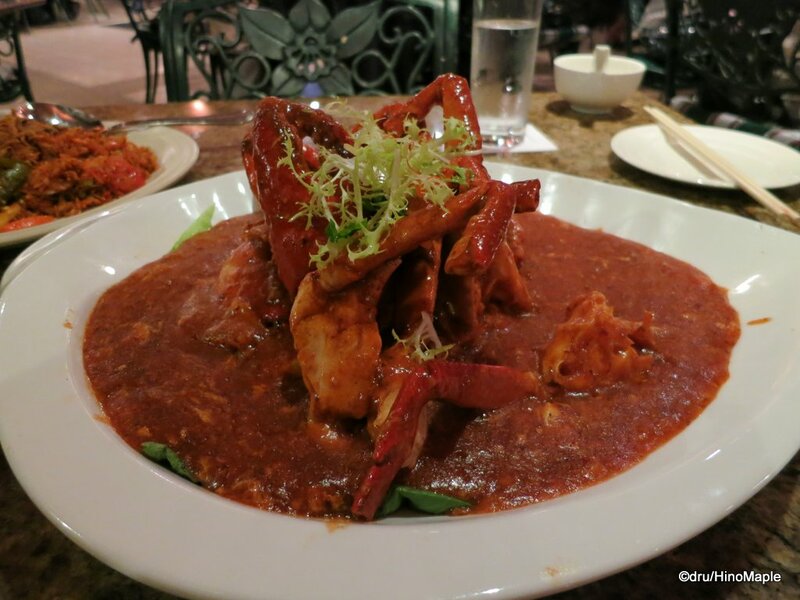 The chili crab was delicious and suitable for at least 4 people. They used Sri Lankan crab which doesn’t have huge legs like the Dungeness crab I’m used to back in Vancouver. The claws were huge for the crab’s size and I enjoyed the food but it was a huge mess. You really need to throw away any politeness you may have had and just dig into it. The sauce of the chili crab was awesome too. Ah Hoi’s also specializes in Chinese buns; specifically a deep fried one that is used to dip into the sauce. I didn’t grab a lot but it was awesome. 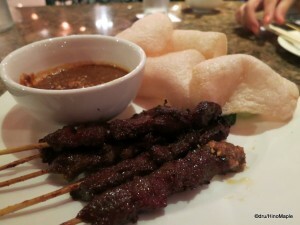 The satay was delicious too, but it pales in comparison to the satay in Malaysia. Sorry Singapore, but Malaysia won this round. 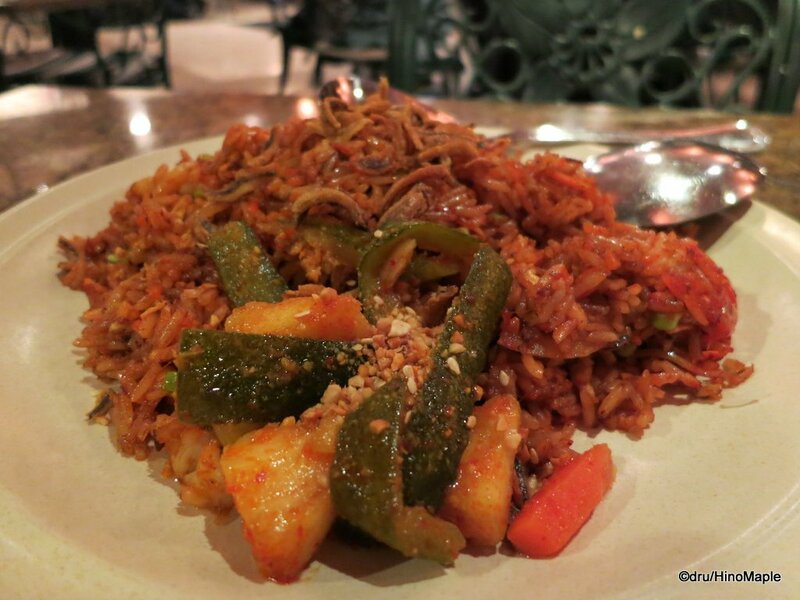 The Nasi Goreng however was a tie between Malaysia and Singapore. I found both to be delicious and I may have lost a little in comparison because I put so much chili crab sauce into the Nasi Goreng. It was that good. On the first morning I arrived in Singapore, I was sleep deprived but looking for a fun time. I went to the adjacent shopping mall to my hotel and found the food court. Since I was in Singapore, I thought it would be best to have some traditional Malay breakfast. 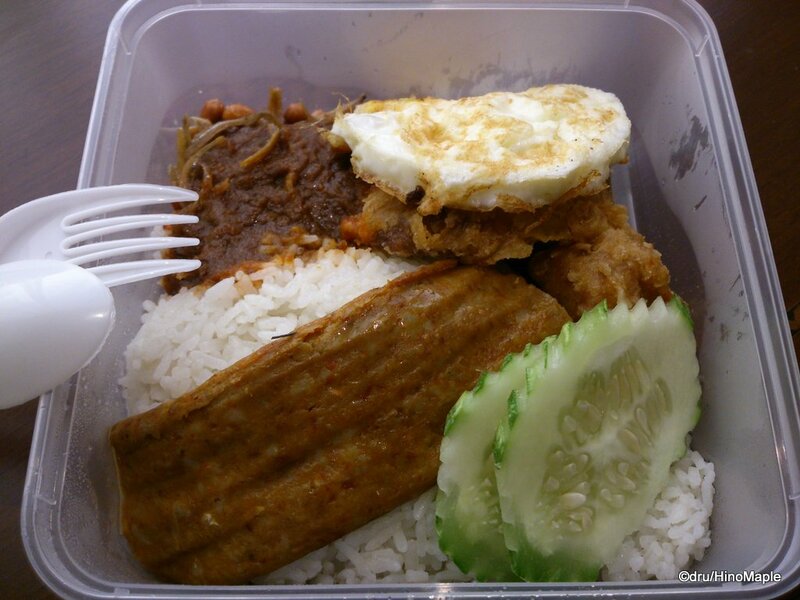 I got some Nasi Lemak take out, probably from a guy who was originally from China, and had a good meal. It wasn’t the best Nasi Lemak as I would reserve that for Mrs. Kwans in Kuala Lumpur but it satisfied my need for it. I can’t really comment on whether Nasi Lemak is better in Singapore or Kuala Lumpur as I really didn’t try to get good Nasi Lemak in Singapore. I had Sergeant’s chicken rice the first time I was in Singapore and I had to have it again. It may not be the best chicken rice but I really enjoy the set meal. 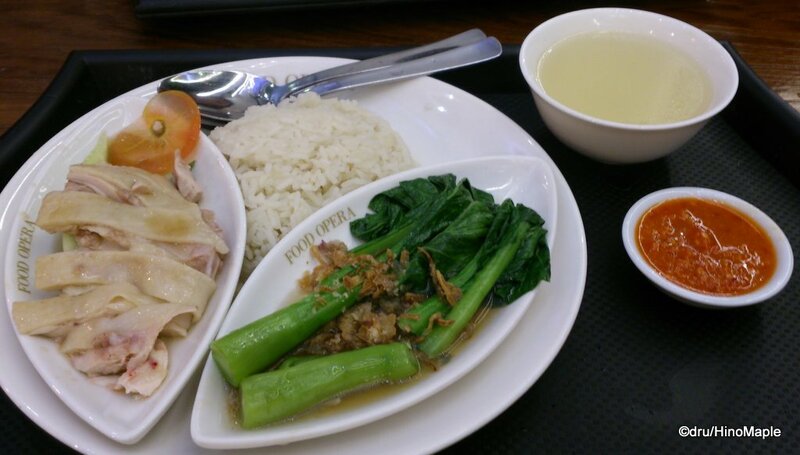 It comes with a small plate of vegetables and of course the famous Haianese chicken. The rice, ginger rice, was also to die for as it was nice and fragrant. Sergeant’s is a fast food shop, so don’t forget to load up on the free chili sauce. It really helps add flavour to the chicken. For the two days I was in Orchard, I kept passing by a really good looking kebab shop called Shiraz Mazzeh. It was an outdoor stall with only 2 seats, but it wasn’t necessary to eat it there. Kebabs can easily be eaten on the go and I decided to grab one on the way back to my hotel. The kebabs are completely different to the kebabs in Japan. In Japan, they are loaded with lettuce and just a small amount of meat. These are the opposite as it is loaded with a lot of meat. You can choose your veggies, and I had everything including a load of jalapeno peppers. You can also choose your sauce, so I got the barbecue and chili sauces. It was really good as they also toast it before giving it to you. 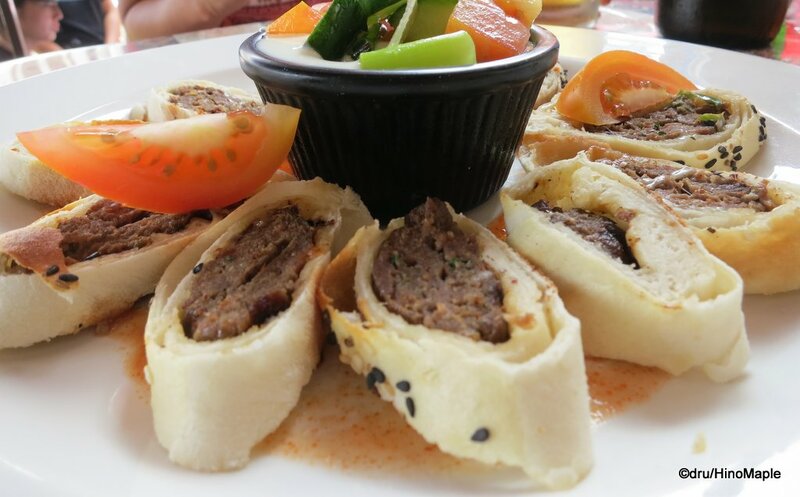 It was more of a pita wrap than a kebab, in my opinion, but it was damn good. 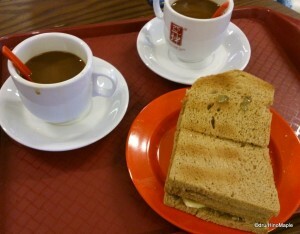 I can’t go to Singapore without having at least some coffee and kaya toast. I love the sweet kaya spread and it is a perfect breakfast or afternoon snack. I’m not a fan of the eggs that you can get and the combination of sweet coffee and sweet kaya toast is wonderful. The coffee, as you may remember from my last adventure 2 years ago, is very sweet as they add condensed milk to it. It is also very strong as they brew the over and over again letting the coffee grinds steep through the liquid several times. They do add a little hot water to keep it from being too strong, but it is too good to not enjoy it. It really wakes you up and helps you get through your day. 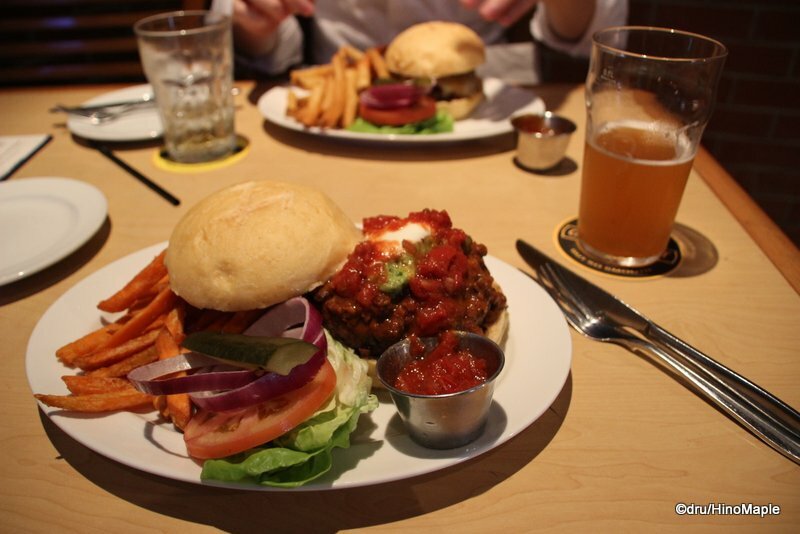 I often try to eat a little western food when I go to Singapore because they tend to do it a bit better than Japan. While I don’t think I can get any deep dish pizza like I can in Tokyo, I can often get a decent burger or something similar when I go there. 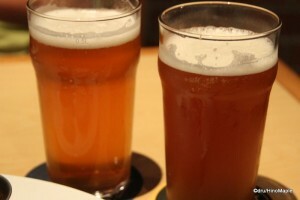 I went to a micro brewpub called Brewerkz and had a couple pints as well as some of their food. 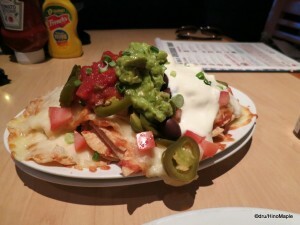 I had a Mexican style burger, a mushroom pizza, and some nachos. Everything was pretty standard pub food and I would happily go back, if not for the food, for the beer. The burger itself was really good and I would recommend anyone to try it. They cook it to order, so if you want a rare burger, you can do it that way. Either way, Singapore still does a good job with western food. 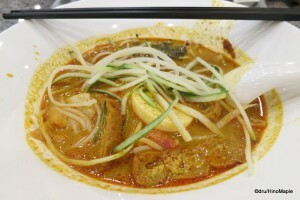 Laksa is a dish that I had a taste of before but didn’t really get to eat it properly. That’s the perils of sharing food with the Saviour at times as I sometimes ending up getting just a single taste of something. I made sure I had some Laksa this time and it wasn’t bad. While I prefer to eat spicy food, the Laksa I had was not as spicy as it could have been, and on a hot day, soup is not always the best dish to eat. 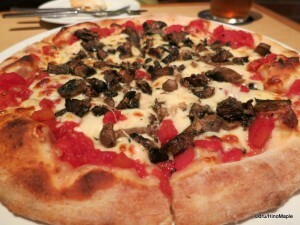 I did enjoy it a lot and I love to eat it, so you can be sure that I will be eating it again in the future. I only wish I knew a local who could take me to various places to eat the best of the best, but that won’t be for a while. 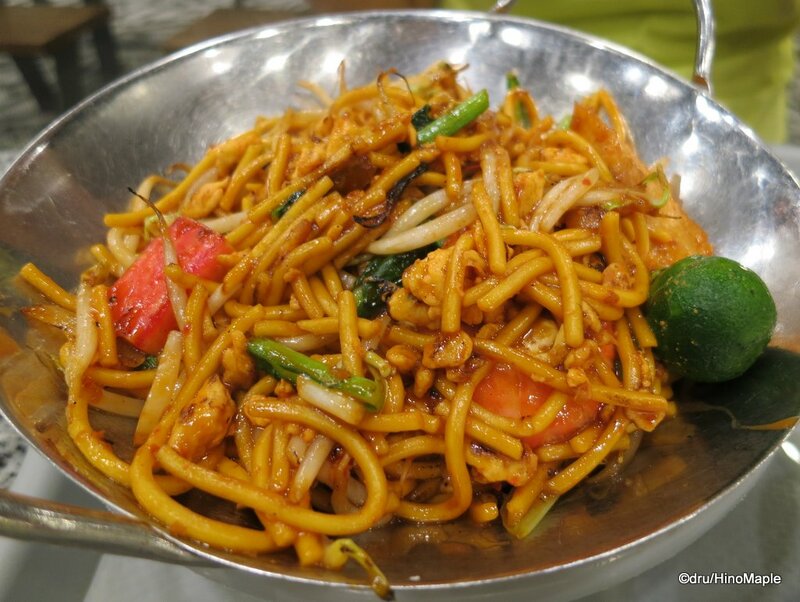 Mi Goreng, or Mee Goreng, or Mie Goreng is a dish that originated in Indonesia and has Chinese origins. It is very similar to Yakisoba but has a definite SE Asian flavour to it. In Singapore, they often use tomatoes to give a little balance to the spicy sambal sauce that is often used. I often try to eat Mi Goreng as I need a little spice to my food. It is great in the heat of Singapore and keeps you cool. I also love the little limes that often accompany it and the combination of sour and tart with the spiciness of the sauce is a wonderful combination. I can never get enough of this, although having Nasi Goreng is a close tie with Mi Goreng. For my second trip to Singapore, I made sure I revisited an Indian shop that I visited before. While the owners may have changed, and the menu certainly did, the food was still pretty good. Aside from the very annoying waiter, once he left, the food was delicious. 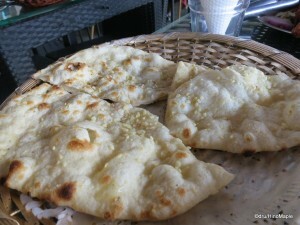 I ordered some garlic naan, cheese naan, a type of red curry that was “very spicy”, and chicken tandoori. 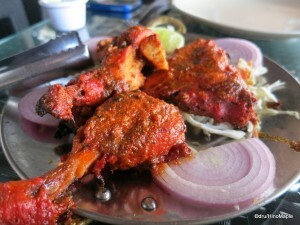 Whenever I eat tandoori, I often think it is a bit green looking, but whenever I eat it in Singapore, it is reddish. The chef may be the same as the restaurant still said it was their specialty and the papadum with a mint dip was the same as well. The food was delicious and accompanied with the beer on the river made it a great afternoon lunch. It was not cheap by any standard, but I knew what I was getting into and I knew I was paying a premium to enjoy the view. I may not go back to that same shop again as the waiter annoyed me too much, so I might try to find another shop next time. Before heading to Singapore, I watched a famous TV show called Moya Moya Summers. It is a famous comedy duo and a female announcer walking around different areas of Tokyo, and various international cities. The entire show is premised on the idea that they just wander around the city finding weird and quirky things about the people living there. It is a fun show to watch and when they went to Singapore, I was sure to watch it. They visited Arab St. and when they did, I had to visit one of the Turkish restaurants that they visited, Istanbul Grill’s & Cafe. While the show was very funny, the food looked delicious and they even remarked that it was good. While this may seem like a typical Japanese thing to do, they actually seemed to like it. I did have a dip plate, and a kebab and it was awesome. The price was a little high, similar to other tourist areas, but it wasn’t going to kill the bank. I had enough food and had a nice time enjoying the food, so I think I might return again in the future. Singapore has a large Chinese population and you can easily see the influence of the Chinese. You can find Dim Sum all over, well not all over but in many places, and it is a lot easier to see what looks to be good Dim Sum. Unfortunately, I didn’t know where the good shops were and ended up eating what was just average Dim Sum. It wasn’t special but at least it was better than regular Dim Sum that I can get in Japan. When you come from a city that has the best Dim Sum in the world, it is hard to find good Dim Sum anywhere else. I never knew this but pork knuckle is a borrowed specialty in Singapore. 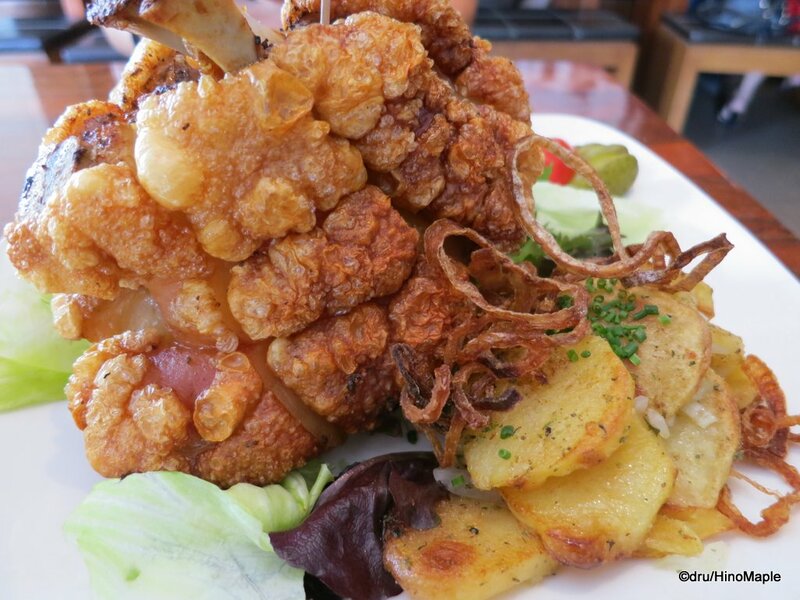 It is a traditional German dish from Bavaria, as far as I can tell that was originally called Schweinshaxe. In Singapore, you can find pork knuckle in many places but I wanted to go to a shop called Brotzeit because I heard they had some of the best pork knuckle in the city. I remembered visiting that shop the last time I was in Singapore and having a pint and some finger foods. It wasn’t a cheap shop and it wasn’t cheap the second time I went. I ordered the pork knuckle as well as a salad. Let’s just say that for me and the Saviour, the pork knuckle alone would have been enough. It was not the typical pork knuckle you’d find in Bavaria, as far as I can tell. It was roasted but the skin was roasted more alike a Chinese roast pig. It had pork rinds on top as if it was deep fried a little as well. It was delicious but so huge that 4 people could have eaten it and still be full. How silly of me to think that the food portions in Singapore would be Asian sized rather than western sized. It was delicious and I would gladly go back for it again, although next time I’ll know to keep away from the other dishes as the pork knuckle alone is more than enough. 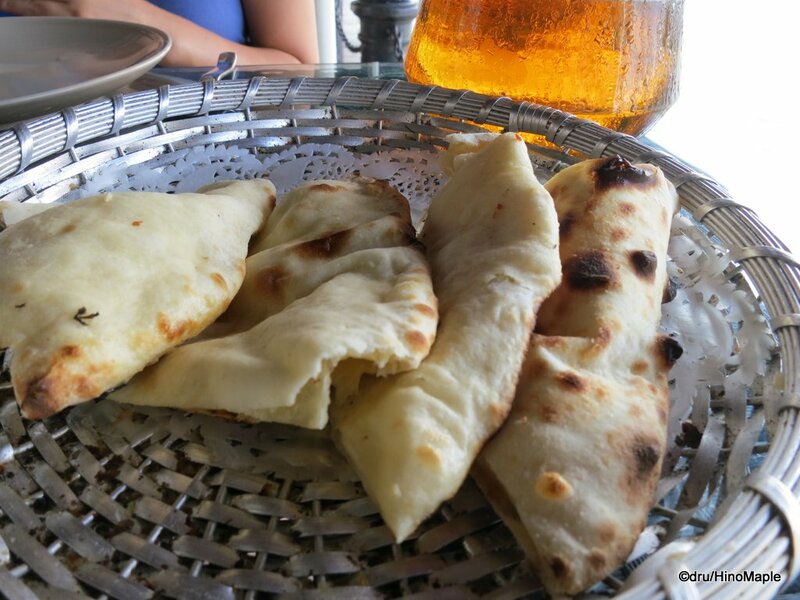 This entry was posted in East Asia, East Asia Food and tagged Ah Hoi, Ah Hoi's, beer, Brewerkz, Brotzeit, burger, Cheese Naan, chicken rice, Chili Crab, coffee, curry, Dim Sum, food, garlic naan, Istanbul, Istanbul Grill & Cafe, Istanbul Grill and Cafe, Istanbul Grill's & Cafe, Istanbul Grill's and Cafe, Kaya, Kaya Toast, Kebab, Laksa, Mi Goreng, naan, Nachos, Nasi Goreng, Nasi Lemak, pizza, Pork Knuckle, Red Curry, Satay, Sergeant, Sergeant's, Sergeant's Chicken Rice, Shiraz Mazzeh, Shiraz Mazzeh Kebab, Singapore, Singapore Coffee, Singapore Food, Sri Lankan crab, Tandoori, tandoori chicken, Toast Box, Ya Kun, Ya Kun Kaya Toast, Yum Cha by Dru. Bookmark the permalink. Those are NOT Tokyo/Japan portions! Looking drooliciously (Druliciously?) 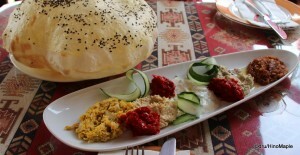 good, especially the Istanbul food. And pizza. And burger. And nachos. The Istanbul food was good, but wish the portions were a bit bigger. Just want more. Yes, there is more to life than rice, but rice is still pretty good. Hi from Singapore! New reader here, stumbled upon your blog when reading up about an upcoming trip to Japan, and coincidentally you’re in my neck of the woods. Glad to see that you are enjoying our local foods, it’s one of the best things in this tiny nation. It’s a little regretful that you did not manage to try the good versions of some dishes though. If you don’t mind, here are some suggestions for great hawker foods. Sugar Cane Juice to wash it all down! The normal ones are good, but do try the ones with lemon added as well. Some of the stalls have insanely long queues during peak hour for lunch though, so try to go a little before or after that. Just a food obsessed fella trying to spread the good word, hope you have a wonderful stay here. Cheers! Thanks for the comment and double thanks for the recommendations. I’ll try to check those places out next time for sure. I still miss eating the good food over there. Hopefully I can make it back another time. PS: How’s planning for Japan? Oh gosh I’d just assume you were still in Singapore, silly me. No worries. The fun of blogging is that you can do it over time. 🙂 I still want to try those places next time I go so thanks for the tip!